During the process of getting a Master degree, my first wife gave Portuguese language lessons to a group of deaf teenagers. In that context, she devised a notebook of clipart illustrated verbs that enriched the lessons. 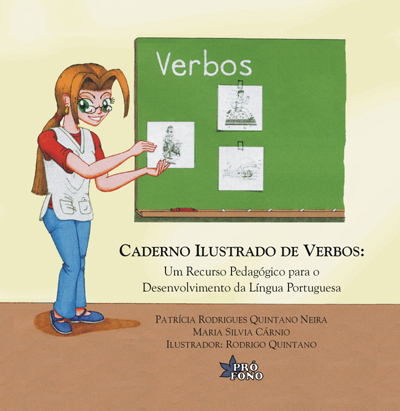 The material attracted her supervisor's attention and so appeared the idea of creating the Caderno Ilustrado de Verbos (Illustrated Notebook of Verbs). I made drawings under request and orientation of both. Afterwards, the material was taken to the owner of Editora Pró-Fono (Pró-Fono publishing company), who got interested in publishing it. 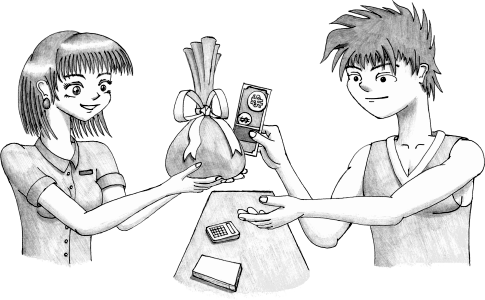 I elaborated 30 drawings to illustrate 32 verbs (the drawing for "to sell" is the same than the one for "to buy", and the drawing for "to push" is the same than the one for "to pull"). The drawings were made with mechanical pencil, outlined with roller ball pen and shaded with mechanical pencil. Only the cover was coloured; the verbs remained in gray scale. The scanning that generated the published material became responsibility of the publishing company. I did not charge nor received any amount of money to produce the illustrations. I dedicated time to that work during the free hours from May 2002 through May 2003. The material was released by Pró-Fono in 2005. The image to the left is the cover of the material, obtained directly from Pró-Fono web site by the time of the release. The original drawing was made and coloured by me in the same way I elaborated the illustrations for the Acerte Sempre bulletin (see the Pixel Pocketknife page for details on the process). Since I granted Pró-Fono the exclusive copyrights to use the illustrations in that material publishing, I put here only two of the images, with low resolution, for the sole purpose of divulging the work. The samples below are result of a scanning I did by myself correspond to the verbs to sell and to buy and to work.